Hi! 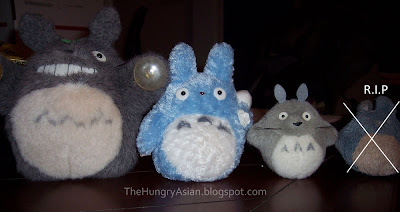 I don't have any nail polish today but I did find all my Totoro stuffies while I cleaned a table off yesterday. The one on the end was a little fetch toy for my doggies, one ate all the buttons off the face, and the other licks it and treats it like her "baby". Years ago when Belle was the only dog we owned, when it was bedtime if you asked her, "Where's your baby?" she would go round up all her little stuffed animals and put them on the bed with us and curl up and sleep with them. It was so cute, but then we got Jasmine and she just eats the babies lol so there went that. Er so anyway that's why that one is so gross looking! Hands off, Valerie! Tomorrow I will show you Fortune Teller! Yipee! Aww Belle sounds like an adordable dog, so does Jasmine sans the stuff animal eating ways haha. I love Totoro, so kawaii! Kae, they're so cute, even the chewed up one! I used to have a Nekobus with suction cup hands in my car, but someone took it! Where do you stick the big grey Totoro? Aww your cute doggie story makes me want a puppy even more ^_^ So sweet! aww...so cute!! I want a dog. She is a sweetie, a little crazy tho lol. I love my babies they are the best! lol yeah dogs LOVE squeakies for some reason! she is the best! lol well that one was so gross so the X was necessary to cover up some yucky fur! haha, I can't t hrow that one out even now. I had the suction cup one for about 15 years now, never put him anywhere (car was tempting in my teens) because I didn't want him ruined! So he sits around the house loungin. lol thanks, I do love totoro! thanks! I just love all dogs! thanks, oh me too I've seen that movie so many times. Not lately tho, I have it on my computer now with english subs finally! lol yeah she is a cutie pie!